Do you find getting to work every morning a nightmare on the Northern Line? 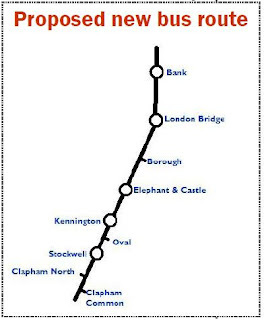 Many residents have complained to us about the severe levels of overcrowding on the Northern Line. The stations are overcrowded and dangerous, and often have to be closed because of congestion. As your local councillors, we campaigning for a new bus service to run at peak hours along the route of the Bank Northern Line, with our London Assembly Member, Val Shawcross. We want to see a new bus service which starts at Clapham Common. We also want to see the current Mayor honour plans made by Ken Livingstone to increase the number of trains on the Northern Line by a third. This toilet woops I mean comment has been removed by a blog administrator like the the central stockwell decades old public toilets were removed by Lambeth Labour Council back in 1988. QWuick do one behind the Nile Cafe trees on Ye Studley Estate. I am disappointed that comments are being removed. I thought this blog stood for freedom of comment. Shame on you. The comment was removed because it contained an offensive word in it. I'll remove any comments that are offensive. If the person wants to repost without the word, happy to have it up.